6 February 2015. Engineers at University of Texas in Dallas are studying the potential of smartphones to boost the ability of hearing aids to help people who are hard of hearing. Electrical engineering professor Issa Panahi is leading a team of engineers and audiologists in a two-year, $522,000 project funded by National Institute on Deafness and Other Communication Disorders, part of National Institutes of Health. Hearing aids are designed for people with hearing loss, due to age or damage from excessive noise, that need help hearing spoken words and other sounds. The devices are worn in or behind the ear, and consist of a microphone, amplifier, and speaker. Sound waves are picked up by the microphone, converted to electrical signals that are amplified, and sent to the speaker that converts the signals back to higher volume sound waves. 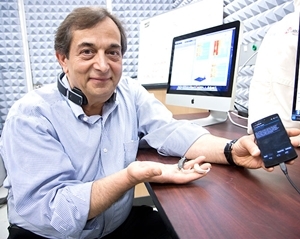 Panahi and UT-Dallas colleagues, including experts in speech and hearing, plan to develop algorithms to improve the processing of signals captured by hearing aid devices, but using the more powerful capabilities of smartphones. These algorithms will be designed to better discriminate between background noise and spoken speech, and thus enhance the quality and intelligibility of speech signals. The project is also expected to help people with smartphone/hearing aids to improve their perception and recognition of spoken words, using the more powerful devices to better hear speech that would otherwise be corrupted by background noise in common day-to-day situations. Thus the users would be able to customize their experiences with the devices, not only with more powerful technology, but also by improving the perception of speech individuals are likely to encounter.